If you have a boy from age 6 to 10, or at least live around one, you’d have surely heard the earth-shattering, “3… 2.. 1… Let it ripppppp!!!!”. But there are lot of people out there who have no clue about Beyblade Metal Fusion. Since I’ve been exposed to passive beyblade fever which has gripped my household for the past year, I thought I’ll throw some light on the subject. For starters, Beyblade is a metal spinning top. Before you say, “Ah, our good old bambaram!”, let me assure you its a bit more complicated than that. Its made of 5 removable & inter-changeable parts : face bolt, energy ring, fusion wheel, spin track & performance tip. Plus, it has a story. Or an epic drama. Which airs in Cartoon Network everyday. Of course, the hero is not a beyblade. 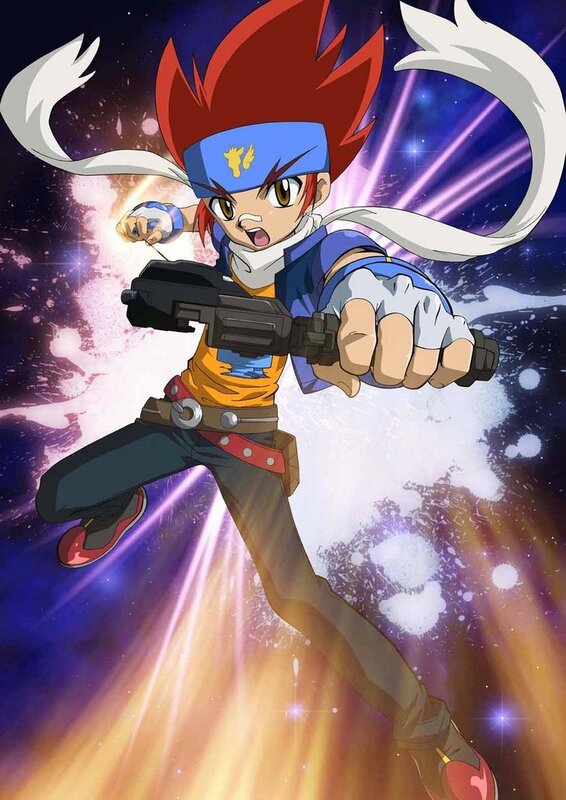 It is Gingka Hagane, a boy who owns a blueish bey, which has the spirit of Pegasus, a white, flying horse. He wanders from town to town looking for formidable bladers like him with whom he can battle. He has a group of loyal friends who each own a bey with different spirits. In a battle, the fighters do nothing but, rip their respective blades in a stadium, stand around & cheer for the spirits which emanates from the beys. I was quite disappointed, actually! After all the war-cries, tight close-ups of faces contorted with rage, is this all you can manage??? They also have a common enemy, who runs the Dark Nebula organization. He constantly sips orang juice & has a lightning streak in his hair. So, there you have it. A hero, a villain & hundreds of battles everyday to establish each other’s supremacy. This keeps most of the boys I know glued to the TV at nights. And during the day, they play non-stop with their beybaldes, screaming ‘Let it ripppp!’ the battle cry of every bey battle. When they’re not doing both, they watch endless episodes on youtube or look at all the merchandise available online and drive their parents up the wall with their demands! The shops are all so cunning too. The shelves are all relatively empty most of the time. I’ve spend hours driving my son from one store to another in search of the elusive Beyblades only to find out there’s no stock. Then suddenly their shelves are full. For exactly 10 minutes. Because, sometimes I go back in an hour to get some forgotten bit & there are hardly any Beys left! Once, a friend swore me to secrecy and tipped off about a dealer in Parrys Corner who has all the Beyblades and will sell you the entire set for about 2000/- ! This was just before christmas & thanks to all the TV he watches, my son had written an elaborate list to Santa which featured only beyblades & their accessories. Thrilled, I called the dealer. Of course he had the entire set. If you can wait a few days more, he could even supply a stadium! Wow! I was impressed. Another great friend whose office was round the corner to the dealer, offered to pick up the loot for me! I was so proud of myself, when I drove out of my friend’s place later that night with a set of 12 beyblades stacked in the boot of my car! I waited endlessly before my son fell asleep, before I could open the huge package. But these blades did look different. They were more elaborate than the ones he had. Suddenly nagged by a little voice which warned me of a huge scene that may break out if I leave these under the tree, I quickly hid these deep in my cupboard & ventured out to buy something else the next day. And a few days later, after my son got over his disappointment of not getting anything from his list to Santa, I slowly told him that my friend had actually got him a set of beyblades. He leaped from the sofa and wouldn’t stop screaming till he got the loot. A few seconds of stunned silence followed after he opened the bag. “But Amma”, he said in a small voice, “these are fake Beys! See! Its all written in Chinese! These don’t come on TV! Tell uncle X that the shop keeper has cheated him!” He nodded wisely. Well, thank god for that little voice, I thought with a sigh. “Hmmmm, yeah, he loved it!” I lied, not having the heart to repeat what my son had said about him getting cheated. “So what about the maidan?” He asked. “What maidan?” I furiously tried to think if I ‘d promised to go along for a sporting event. “Oh, you mean the stadium!” I laughed. “Umm. nope! I’ve already got it..” I lied again. But all this was ages ago. Now that Funskool India has got into the act, every shop is fully stocked with all the Beys you can think of. They even have all the accessories like the stadium, shoot launcher, grip launcher, srting launcher and the works. Ever since they’re available all over town, my son is slowly losing interest in Beyblades. He’s more into Dragon Ball Z, and has started collecting those toys zealously. What’s Dragon Ball Z? Oh well, that’s another story altogether!